Work on the driveway slowed unexpectedly this week. Testing was done on the concrete patches, and unfortunately it was not ready to accept the new membrane. The testing determines whether the concrete has adequately “cured”, which is when enough moisture has disipated. Despite near perfect weather, it was too moist to accept and bond with the new membrane. So the contractor and our engineer agreed to wait an additional week and conduct testing again. Assuming it’s ready and the weather cooperates they will begin the membrane installation. 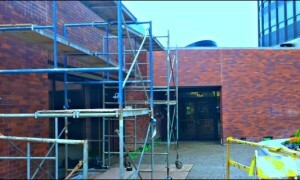 Tuckpointing and brickwork continued along the plaza wall. The bulk of the work will be finished this week with finishing and detailing being done next week. Along the top of the wall they will be removing the limestone copings and installing flashing. This is something that was not done when the building was built in 1971, which is now a standard detail on masonry walls. The “flashing” is a moisture barrier that helps protect the brick below and prevent water infiltration. We have done this work along other areas of the brick wall around the building when we have conducted similar repairs in the past. The contractor also advised us the railing system is in fabrication. Once the driveway is completed they expect to be able to begin installing the railings. The vertical panels along the plaza are also in production – this is the portion of the wall along the sidewalk. Once completed, installation will begin. HOWEVER – ComEd has reported they have scheduled work to replace the roof of the main vault serving Park Tower, which is just next to the bus stop. You can identify the location by the metal grates in the sidewalk. They reported they expect to be tearing up and replacing this portion of the sidewalk the first week of December. Unfortunately, it makes the most sense to wait to install the panels along this portion of the plaza. They would just need to be removed for ComEd to complete their work, which would like damage them in the process. We are awaiting word on the exact timing and other details, and will spread the word once we know more.